Yo-Yo World Magazine: Terrifically ugly, even for the 90’s. 1999 was probably the high point of the last global yoyo boom, that event horizon right before everything crashed and burned HARD. In retrospect, 1999 really was the year that it died and it was an ugly, ugly death. And one of the ugliest parts was the arrival of Yo-Yo World Magazine, brought to us by H&S Media. Other fine publications from H&S Media included Mary Beth’s Beanie World Magazine, and WOW (World of Wrestling) Magazine. They were a publisher who just rushed in on a fad, threw together something hasty and ill-produced, and milked as much money out of it as they could before the fad crashed and burned. Eat The Pizza YoYo Trick with A.C. Slater? The magazine had exactly the sort of content you expect from something like this…it was written badly, quadruple spaced when possible, and got pretty much everything wrong. But when they published this interview with Olympic sharpshooter and yoyo enthusiast Koby Holland, they gave us this incredible image…and for that we should be ever thankful. Yo-Bonic, the worst name for a yoyo company ever. There was a recent conversation on the YoYoExpert forums about someone wanting to start a new yoyo magazine. Gaze upon these pictures and despair, young man, and be careful of the path you tread. Yo-Yo World Magazine lasted 4 issues before going the way of Yo-Bonic, Playmaxx, BC, Custom, Black Mamba, and nearly all of the other companies that bought ads in the magazine. RIP, Yo-Yo World. If you add “Yo-” to the beginning of anything, you are awful. 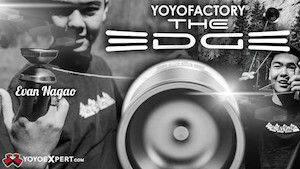 YoYoFactory has a TON of amazing yoyos featured right now on design-centric shopping site, Fab.com. 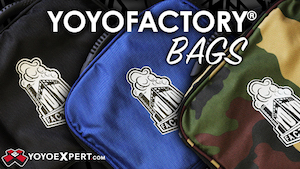 With huge deals on plenty of metal yoyos, including Supernova, Genesis, Catalyst, 888, and SuperG, this is the deal of the century for YoYoFactory fans. The sale only lasts for 6 more days, and there are limited quantities of each yoyo available at these prices. Get ’em while you can! CLYW just dropped this new video featuring Charles Haycock and World Champion Jensen Kimmitt to promote the upcoming release of five colors (solid black, grey, blue, purple & orange) of Fool’s Gold Avalanches in the CLYW store. Available this Friday, February 1st at Noon MST, “Fool’s Gold” is the term that CLYW uses for their factory seconds. It’s a great chance to scoop up an amazing yoyo at a much lower price than usual…don’t miss out! Just got a first look at this new product coming soon from Duncan Toys….the “Yo-tility Holster”. I really can’t wait until companies can make yoyo accessories without adding the word “YO” to them, but regardless of that…this actually looks like a really good and dead useful product! A combination sling holder, bearing removal tool, and string cutter? HELL YES! No word on price, but we’re guessing it will be around $5.00 or so. YoYoFactory‘s 2013 West Coast Tour and Southern California YoYo Contest ended with a bang this weekend, with dozens of new yoyo players showing up to compete for the very first time, and established champs like Alex Hattori, Ernest Kahn, Clint Armstrong, and more competing for the top prizes. The YoYoFactory demonstration team spent two weeks in and around the Palm Springs area doing daily school and in-store demonstrations and teaching sessions, and judging by the contest turnout the tour definitely did its job! With an estimated attendance of more than 600 people and nearly 50 registered competitors, YoYoFactory is doing a great job bringing new players to the sport, and they got a ton of press for this event! Full results are below! I would like to offer a huge apology to Alex and Linda Hattori. Alex did an incredible job with his 3A freestyle in the Open division, but unfortunately there was a mistake made while calculating scores and Alex’s 1A Prelim score was used instead of his much higher Open score. He didn’t recieve his earned 2nd place title and instead was calulated as 7th. Alex and his mother Linda very kindly asked to see his raw scores and remained persistent during a busy time of the contest, showing us a mistake that would otherwise have gone unnoticed. I would again like to apologize to Alex and his mother but also thank them for bringing this to our attention, and we certainly intend to improve our accuracy for the future. Jason Cheow from Team C3 Singapore shows off their Berserker, Trident, and Alpha Crash models in C3’s SIXTH video released so far this year. This amazing Hong Kong manufacturer just won’t let up on the new video front! And with their new releases doing well at retail and Milan Kurfirt breaking the Czech “long sleeper” record with a 23:54 spin on their BTH model, C3 is off to a roaring start for 2013! The new Harold Owens III signature yoyo, the H.O.T. from YoYoFactory, gets some love from Ibrahim Rahman in this great new video. Well worth the watch, it’s 1:43 of someone who makes yoyoing look really damn good. Spinworkx posted up a new player profile, and Kendrick Hu knocks it out of the park with this great combo sequence utilizing a lot of familiar elements but with some really smooth and original transitions. Definitely another player to watch out for from the long-respected Singapore yoyo scene. The Kengarden hosted their first Kendama Battle of 2013 at Dolores Park in San Francisco, with attendees including Lex from Kendama Co, Thomas Holzer from swisskendama, and SacKendama. There was also a huge yoyo player attendance, including Duncan Crew’s Paul Escolar and Sonny Patrick from AntiYo! Sponsored by KEN LAB , Co Kendama , Kendama USA, and Kengarden. Just got news that former Trick Innovator of the Year and World YoYo Champion Jensen Kimmitt will be appearing on YoYoRadio this Friday. Jensen has historically avoided giving interviews so this should be interesting. Tune in online at YoYoRadio.net this Friday evening at 9:30 PM EST. 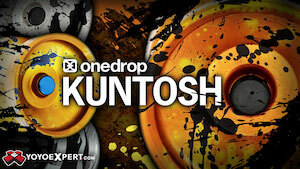 Turning Point has created a more powerful and perfectly engineered yoyo to add to their portfolio. The Outsider is perfect for Triple A and great for Single A, no matter your style you will appreciate the new design inspired by their other amazing yo-yo – the Maxbet. The Outsider has an increased weight of 75g compared to the Maxbet with a 65g weight, this is due to the added weight on the rims. Turning Point also did an amazing job on the color choices while in anodization and the speckle splash is perfect in every way. Not only do the colors amaze but, the play is so insane that your town might banish you for being too fast and smooth. The Outsider comes stock with a Central Bearing Co. Center-Trac Bearing which increases sleep time and overall balance of the yoyo. With a nice straight throw you will never want to use another yoyo. The Turning Point Outsider is available NOW at YoYoExpert.com!